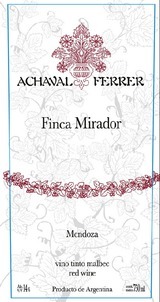 Achaval Ferrer is located in the foothills of the Andes in the province of Mendoza, Argentina. The region's desert climate and soil conditions are ideal for the development of Malbec and other red varieties. Low yields, significant thermal gradients (warm days, cool nights), poor alluvial soils, low rainfall, high altitude and the pure Andes irrigation water, all work together to mature grapes that can be transformed into complex, deep and structured wines made by famed winemaker Roberto Cipresso. Top 100: 2013, Rank: 73 This pure, racy red exhibits a dark side, with layers of spice, graphite and maduro tobacco to the crushed raspberry, blackberry and concentrated cassis fruit. Needs time in the cellar. Best from 2015 through 2022. 1,122 cases made.